I am always excited to try a new offering from The Honest Kitchen. 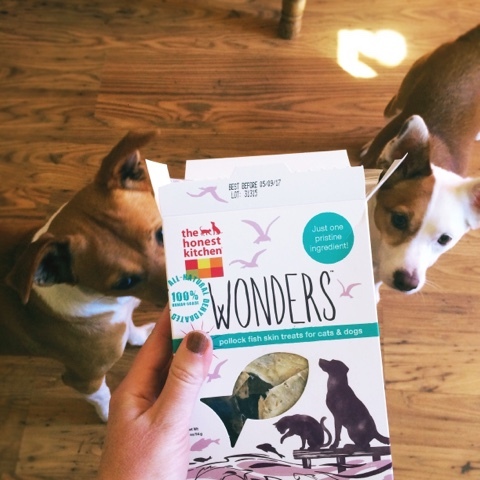 The Ginger Sisters eat their dehydrated food every day for breakfast as part of their rotation diet and I trust in their human-grade ingredients and natural philosophy. I even belong to their auto-ship program so we never run out of Keen, Revel or Beams. 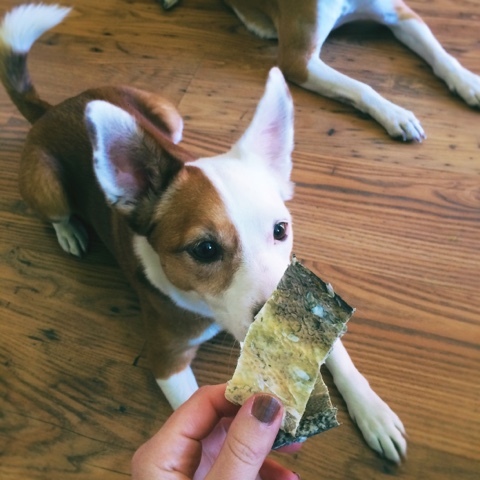 Since Ruby and Boca regularly enjoy the dried catfish skins known as Beams, I thought that the new single ingredient pollock skin treats, Wonders, would be a hit for us. It turned out...not so much. While The Ginger Sisters were anxious to sink their teeth into these stinky, scaly snacks, I was skeptical as soon as I saw them. Unlike Beams, which are cut into strips (Talls or Smalls depending on the size of your dog), Wonders are cut into squares, most about the size of my palm. They are also much thinner than Beams and have a number of large fish scales sticking to them. All of this made me wonder how hard it would be for the dogs to eat them. Both girls accepted the new treats eagerly; however, I was very uncomfortable watching them struggle to chew and swallow the treats due in part to the awkward size. I tried giving Ruby a smaller, thicker piece and it wasn't any better. Maybe they are tougher overall than the catfish skins? I was very surprised to conclude that this an Honest Kitchen product I will not be getting again. I love the option to feed my dogs responsibly sourced fish treats but will stick with Wishes, Quickies and Beams. I'm hoping to find an alternative use for the rest of this box. The Wonders package suggests placing the treats in a puzzle toy which may be worth a try, and I'm also considering cutting them into tiny pieces to use as a topper. 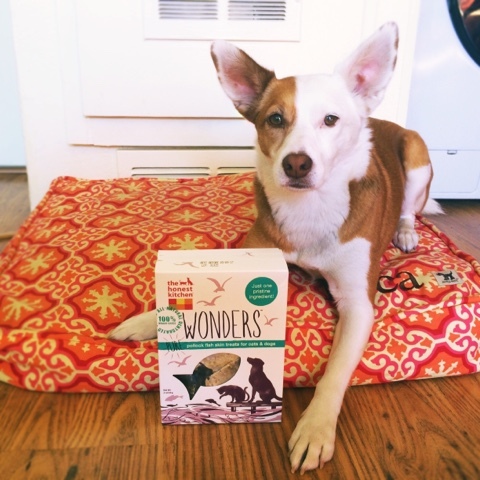 Has your dog ever tried fish skin treats? Disclaimer: I was provided The Honest Kitchen Wonders in exchange for my honest review. All opinions expressed are my own and I only publish reviews for products I feel comfortable using in the day to day life of my pets. Just the look of it is enough to dissuade me. Ickies. Zoe and Phoenix didn't like those! It was so surprising to me because they usually like everything from THK! Barley loves fish skins--even though I think they are disgustingly stinky and hate even taking them out of the package. I've found that she does really well with the Beams that are long and skinny, but she sometimes starts to choke on the ones that are wider like this and I have to help her out, so we'll probably be passing on these, but we do love pretty much everything else from THK. I think that Lilo might love fish skins, but I've never come close to justifying the asking price for something that I'm positive she'd make disappear in three seconds flat. I wound up having to cut this into smaller pieces. Definitely not my favorite THK product. Aww...too bad it didn't work out! I've heard THK makes great treats. Maybe we will pass on this one and go for other fish treats from THK you mentioned above. :) Thank you!